100% natural ingredients. Less than 32kcal per lolly. Packed with real fruit. Suitable for vegetarians.Good source of vitamin D* for strong bones *One lolly a day is a good source of vitamin D, when eaten as part of a healthy diet and balanced lifestyle. 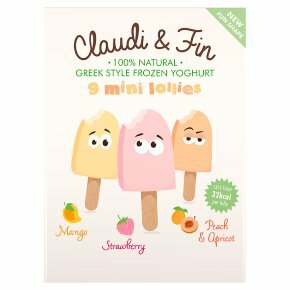 Every Claudi & Fin lolly uses the finest quality creamy Greek style yoghurt, whole milk and real fruit and each lolly is boosted with 30% of your Recommended Daily Allowance of Vitamin D to keep the whole family healthy.